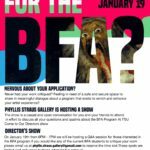 Are you considering applying to the BFA and feel like you could use some guidance and helpful tips? 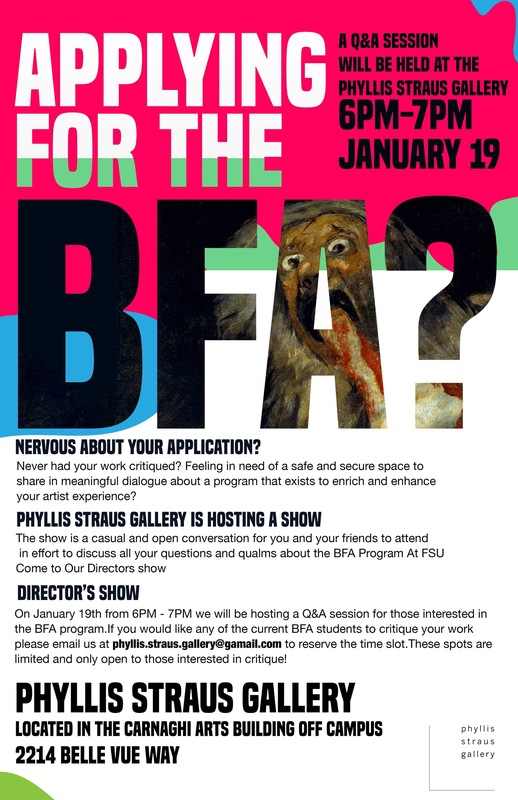 This Friday, Jan 19th, from 6-7pm at the Phyllis Straus Gallery, there will be a BFA Q&A info session taking place during the Director’s Show. Current BFAs will be present to critique your work, engaging in meaningful dialogue about a program that exists to enrich and enhance your art experience. Reserve a time slot at phyllis.straus.gallery@gmail.com for a casual critique of your work. These spots are limited and only open to those interested in critique! Even if you are uninterested in joining the BFA, come out to take a look at what the Gallery’s current Directors have been working on. 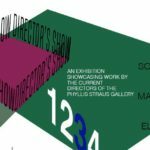 The Director’s Show opens the same night from 7-9pm. The Phyllis Straus Gallery is located in the Carnaghi Arts building off campus, 2214 Belle Vue Way.